I'm an eater. Much like a horse, if left to my own devises, I would eat until my stomach blew up. To help combat overeating at meals I plan out snacks to have mini meals throughout the day; eating 5-6 mini meals keeps your metabolism going and is a healthier option than a few large meals. While eating this way keeps your metabolism revved up, it's a commitment that takes planning. 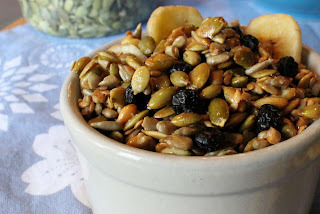 This seed snack mix is a super simple healthy recipe to put together, it's all the tastes and textures you want in a snack-- sweet, salty and crunchy. 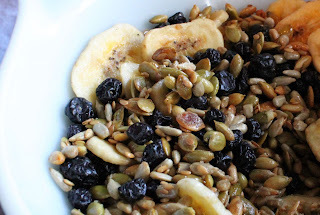 The addition of flax seed helps with cholesterol levels and keeps your digestion system working well too. Take this sweet and salty treat beyond a snack - try it as a breakfast granola over yogurt or sprinkle on your ice cream for a little crunch addition. However you decide to enjoy it, this is one snack that you'll look forward to all day and will help keep you from grazing the pastures. Commit to being fat and happy without an exploding stomach! Tips and Techniques: Store this in an air-tight container for up to 2 weeks. This is also a great give away for holidays or party favors- just fill a cellophane bag and tie with a colorful ribbon. Toss the sunflower, pepita and flax seeds in a bowl with the maple syrup, stir well to coat all the seeds. Pour onto a cookie sheet lined with parchment paper, spread thin. Sprinkle with the course salt. Bake at 400 degrees for about 15 minutes, it's really just long enough to roast the nuts. Keep a close eye on them to avoid burning. Once cooled, break apart the seeds. Add in the blueberries and the banana chips, toss to mix.